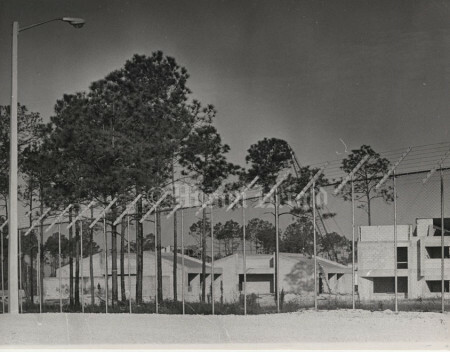 In 1942, with German U-boats sinking ships just off Florida’s coast, the U.S. Navy built Richmond Naval Air Station. 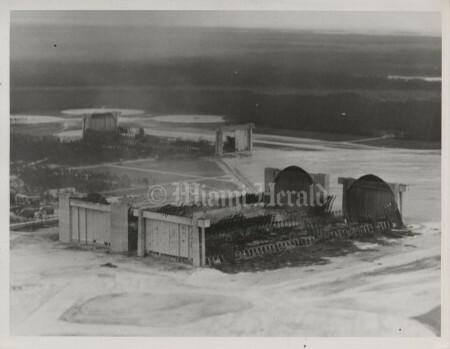 Its three immense hangars housed blimps that could hover over convoys and protect them. 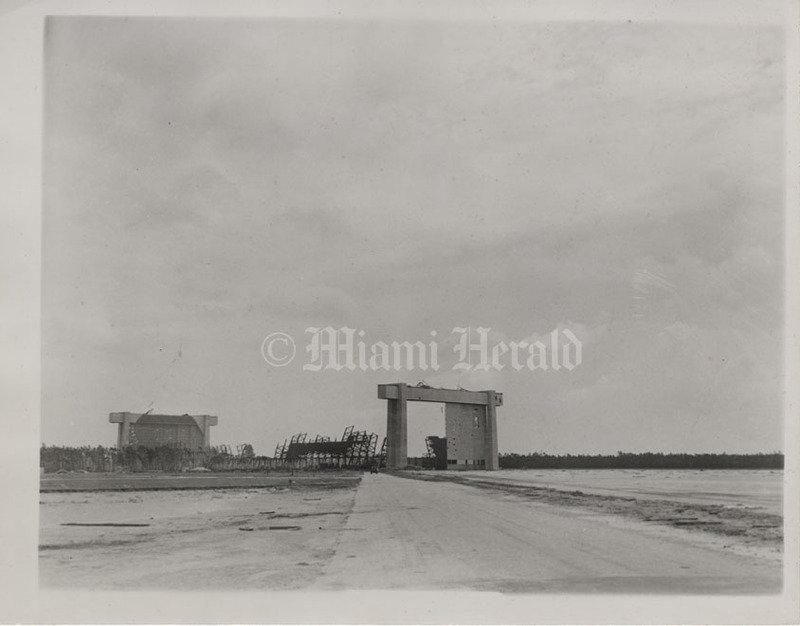 In 1945, with the war barely over, the wooden hangars were destroyed in a fire driven by hurricane winds. Part of the mammoth blimp base is the site of Miami Metrozoo. 9/16/1945, Miami Herald Staff-- The three giant blimp hangars at Richmond Naval Air Station burned during the hurricane of September 15, 1945. 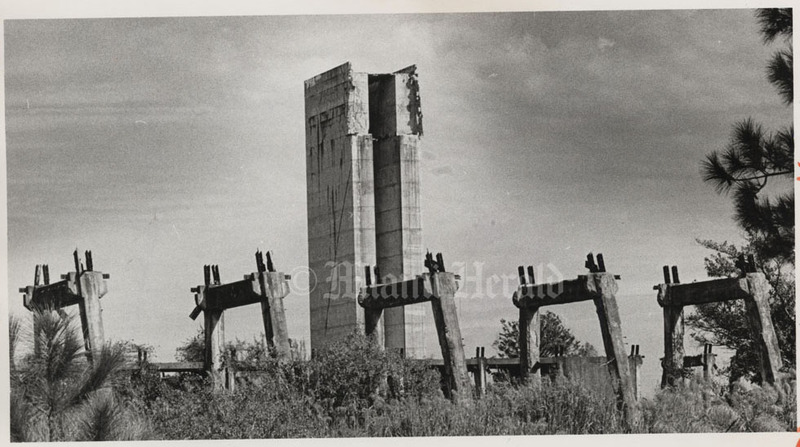 This photograph ran on a page of photographs credited as "Herald Staff Photos." 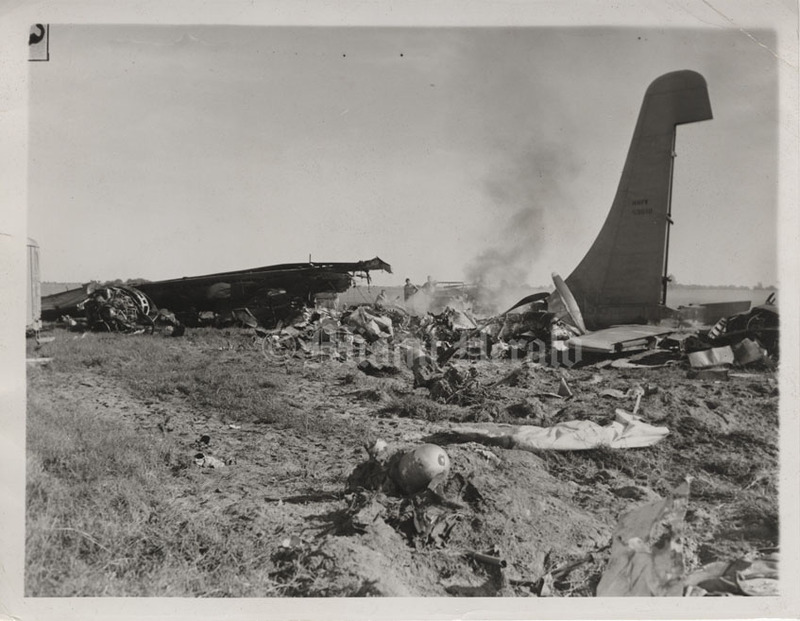 Ran September 17, 1945 with the caption: "Lumber outside one hangar indicates inside pressure may have wrecked it." 9/16/1945, Miami Herald Staff-- The three giant blimp hangars at Richmond Naval Air Station burned during the hurricane of September 15, 1945. 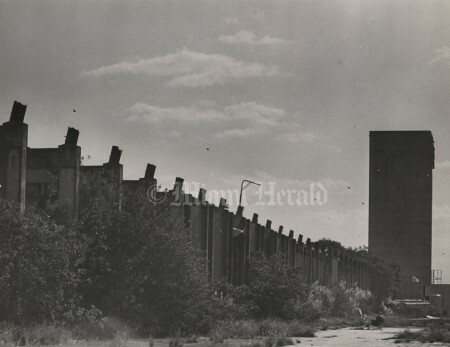 This photograph ran on a page of photographs credited as "Herald Staff Photos." 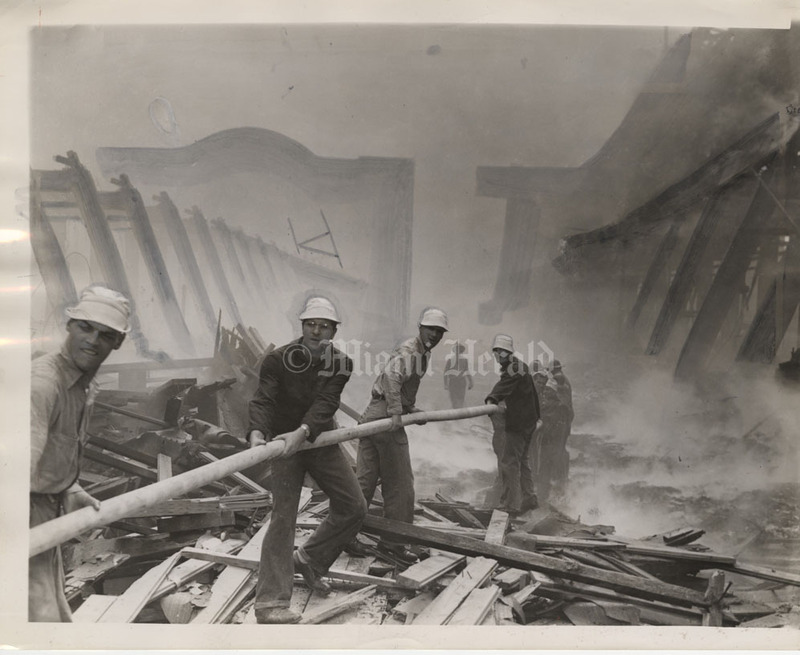 Ran September 17, 1945 with the caption: "Firemen haul in more hose to wet down the smoking ruins which still blazed fitfully on Sunday." 9/16/1945, Miami Herald Staff-- The three giant blimp hangars at Richmond Naval Air Station burned during the hurricane of September 15, 1945. This photograph ran on a page of photographs credited as "Herald Staff Photos." 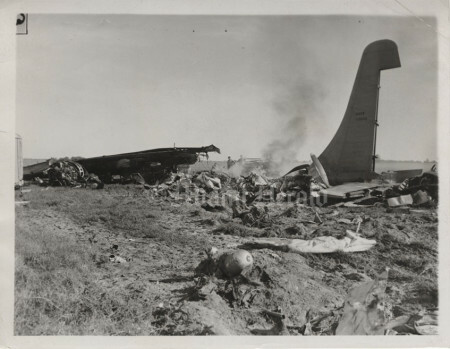 Published September 17, 1945 with the caption: "The huge end structures stand like grave markers over burned out hangars two and three." 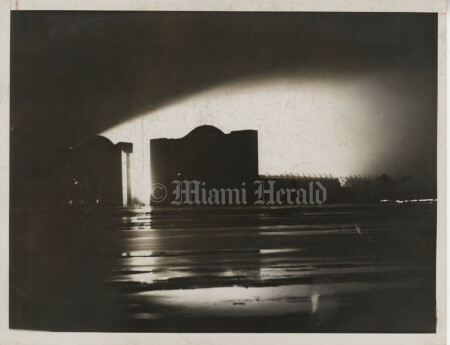 9/15/1945, Miami Herald Staff-- Fire destroys the giant wooden blimp hangars at Naval Air Station Richmond during the hurricane of September 15, 1945. Microfilm was consulted to determine that this photograph was credited in the newspaper as a Miami Herald Staff Photo. 9/15/1945, Miami Herald Staff-- Fire destroys the giant wooden blimp hangars at Naval Air Station Richmond during the hurricane of September 15, 1945. Published caption: "Flames flicker through gaunt ribs of No. 1 hangar looking toward ponderous front doors." 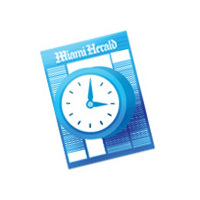 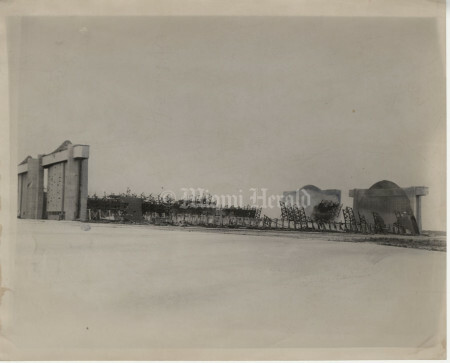 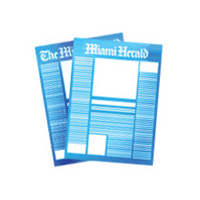 While not specificially credited to The Miami Herald, microfilm was consulted to determine that this photograph ran with similar views that were credited as Miami Herald Staff Photos. 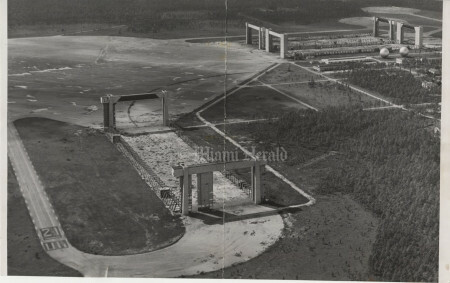 11/25/1977, Joe Rimkus Jr./Miami Herald Staff-- Richmond Naval Air Station. 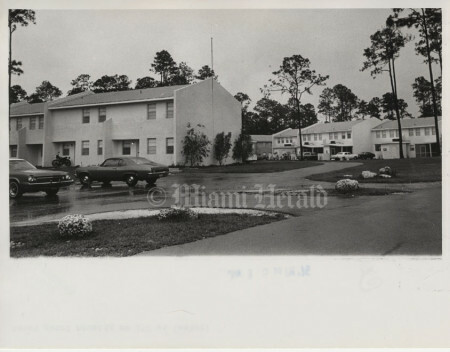 6/9/1976, Battle Vaughan/Miami Herald Staff-- Coast Guard housing area, Southwest 152nd Street. 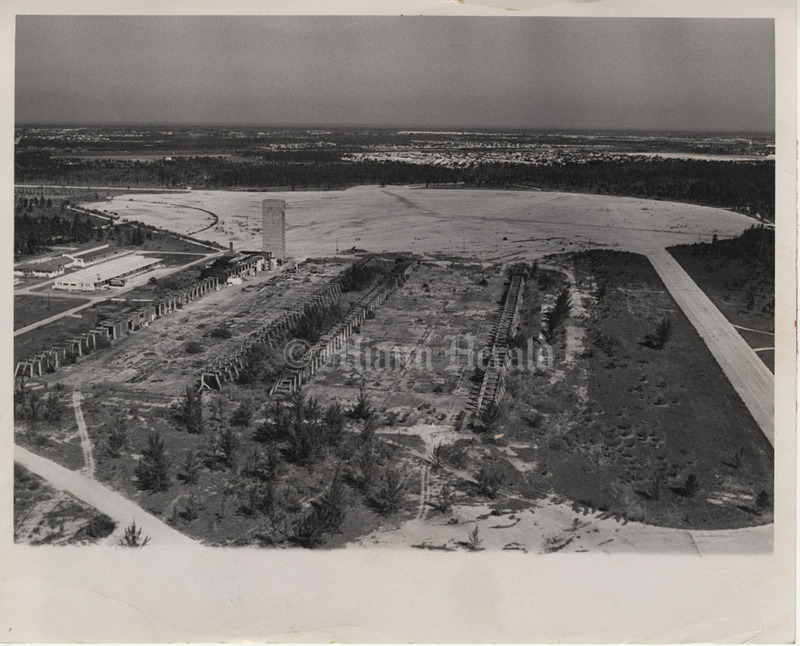 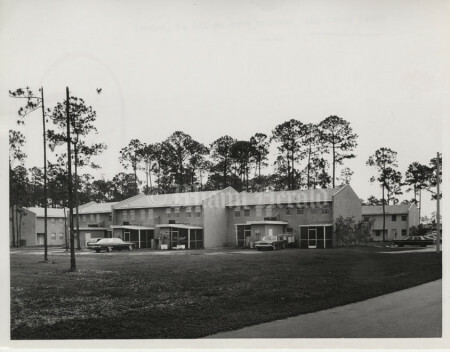 3/17/1975, Bob East/Miami Herald Staff-- The new federal jail for kids keeps going up on Richmond Air Base, site of the new county zoo. 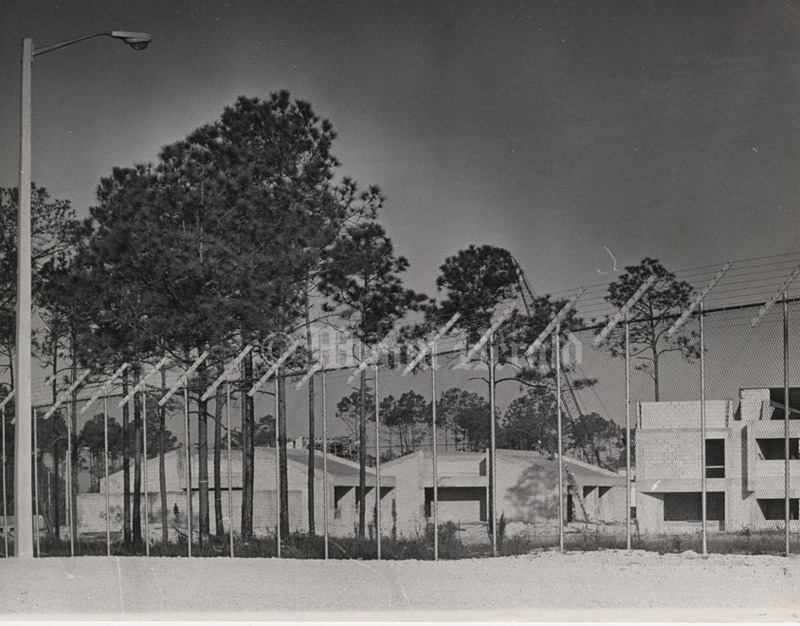 This high fence with barbed wire on top should keep them inside when the conplex is finished. 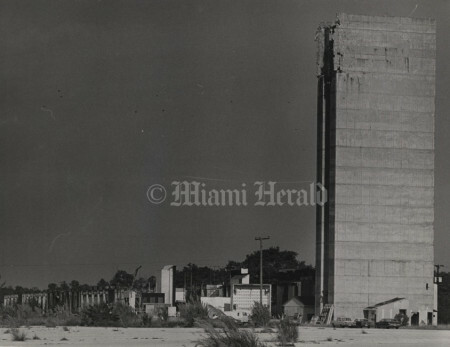 3/17/1975, Bob East/Miami Herald Staff-- Foundation of a former wall of a blimp hangar at the Richmond Navy blimp base, which will soon be the site of the Dade County Zoo. 9/5/1974, Bob East/Miami Herald Staff-- Aerial photo of the remains of the Richmond blimp base in South Dade County. Footprint of two giant blimp hangars can be seen at top center, with the right side of the right hangar's door frame still towering over the site. The remains of the third hangar at out of this picture to the right. 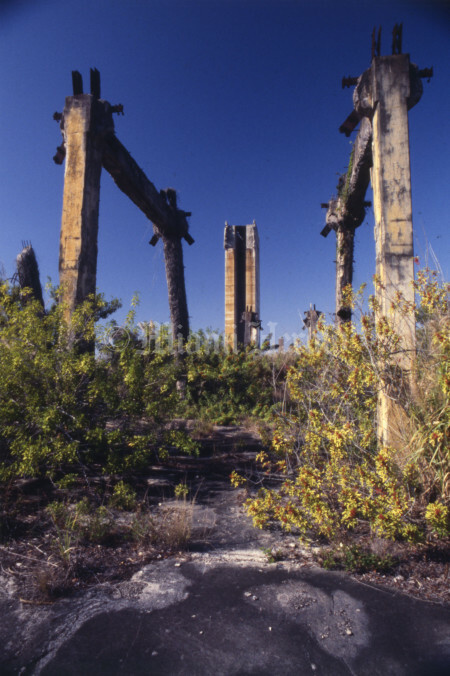 The three wooden blimp hangars were destroyed in a fire during the hurricane of September 15, 1945. 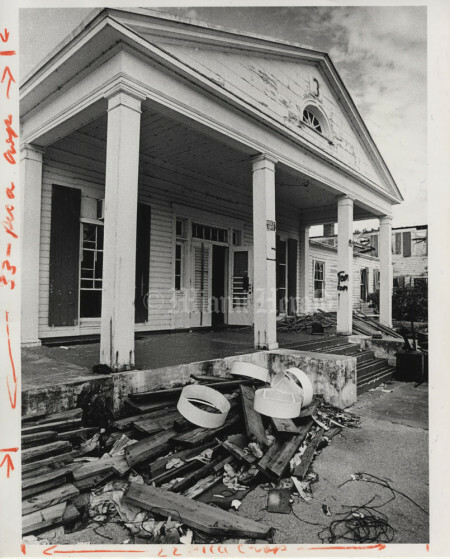 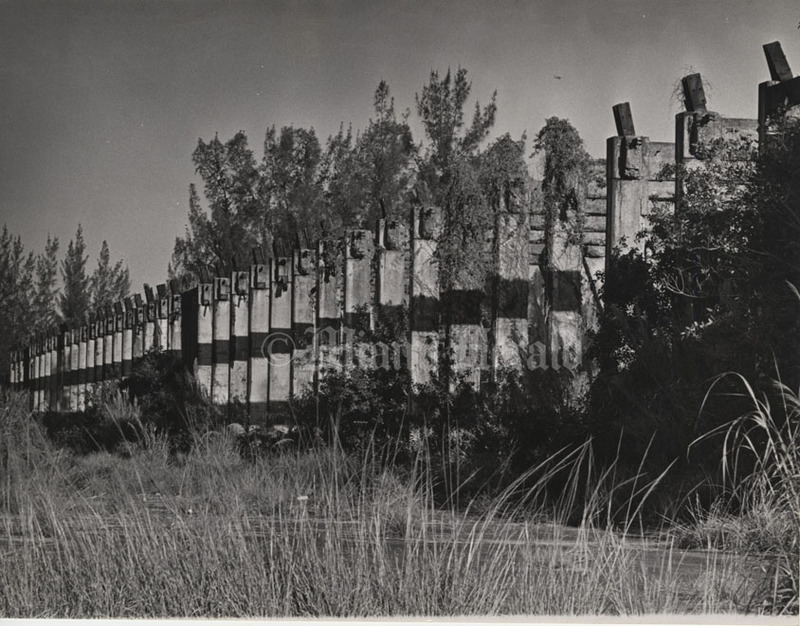 2/22/1974, Bob East/Miami Herald Staff-- This is abandoned building at former Richmond Navy Base in South Dade, now occupied by various interests (and U.S. Army radar station) until new zoo and other projects are installed. 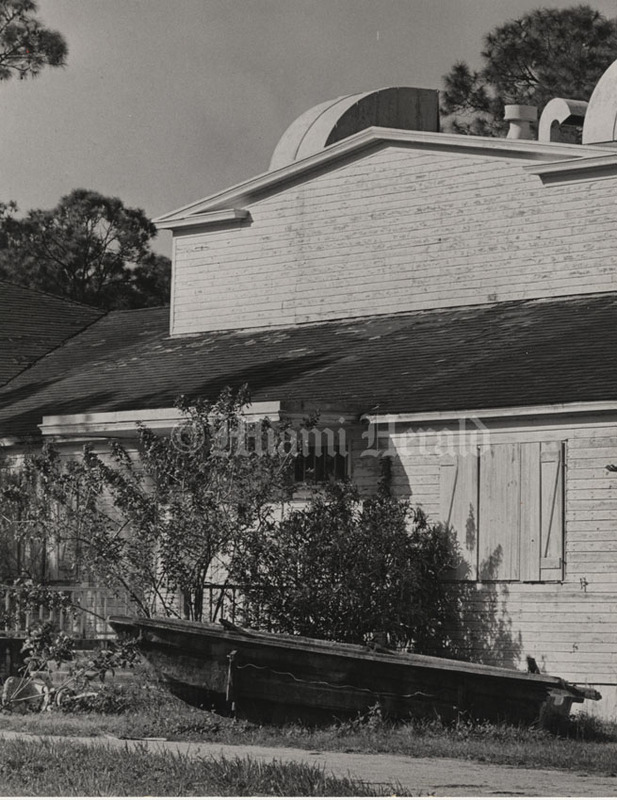 Old boat in front yard. 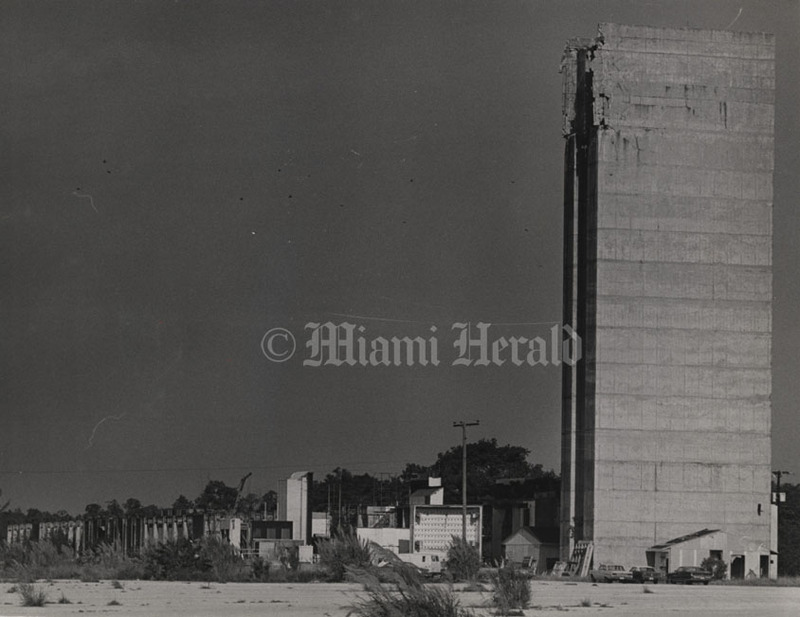 2/22/1974, Bob East/Miami Herald Staff-- Birds fly over South Dade fortress at sunrise -- reminiscent of medieval castle is portion of remaining wall and hangar door frame at old Blimp Base, Richmond -- site of former University of Miami South Campus. 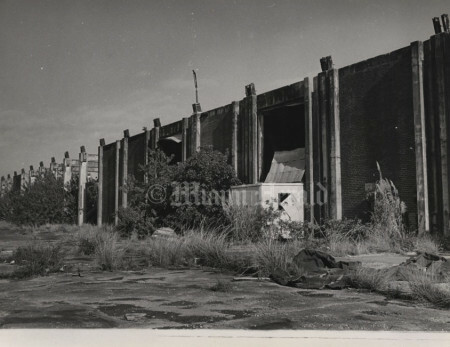 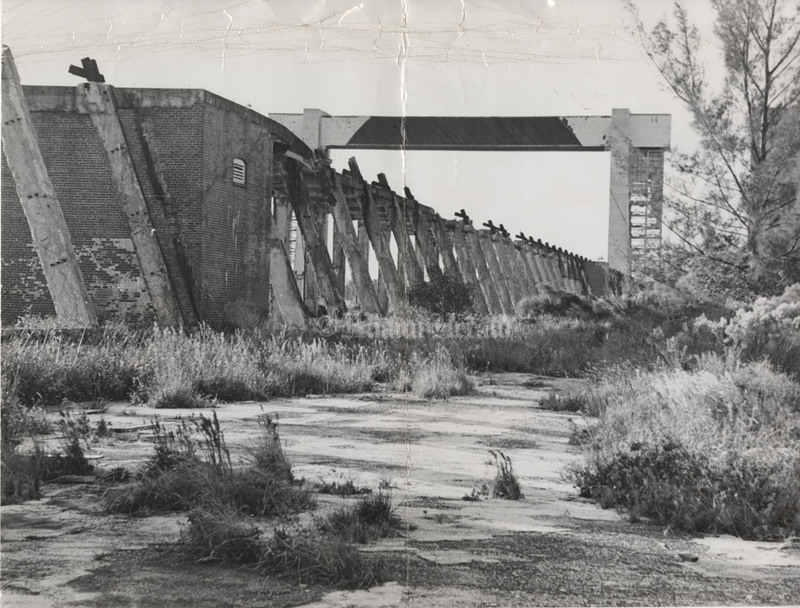 2/22/1974, Bob East/Miami Herald Staff-- Awaiting development or total demolition at former Navy blimp base at Richmond, last remaining fortress like walls of blimp hangar. 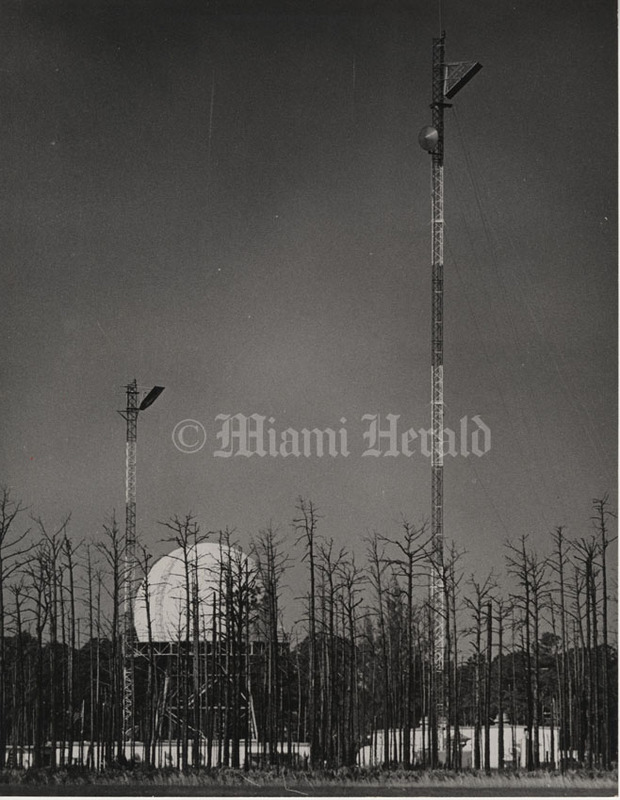 2/22/1974, Bob East/Miami Herald Staff-- Army radar base at former Richmond Navy blimp base in Southwest Dade County. 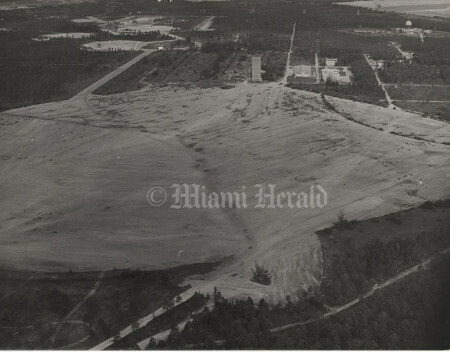 4/12/1971, Bill Sanders/Miami Herald Staff-- Richmond Air Base. Aerial photo shows what remained of the Naval Air Station Richmond blimp base by 1971. 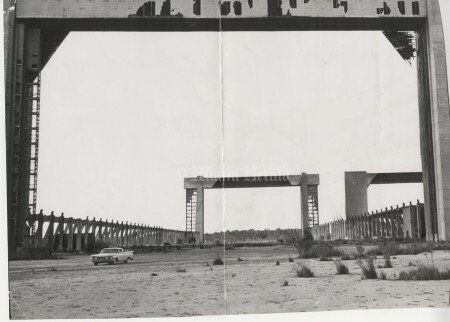 Only the foundation framework of the immense blimp hangars can be seen, along with one towering side of one of the great doorways, giving some idea of the original height of the buildings. Three immense wooden hangars burned during the hurricane of September 15, 1945. 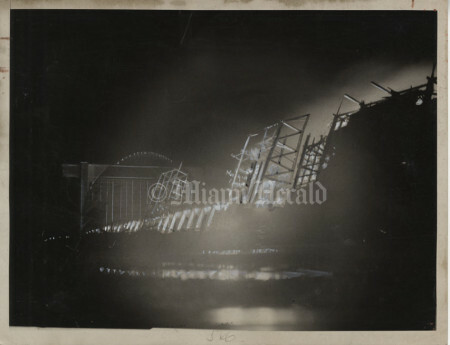 Undated photograph stamped "Miami Herald Staff Photo" shows damage to immense blimp hangars at Naval Air Station Richmond. 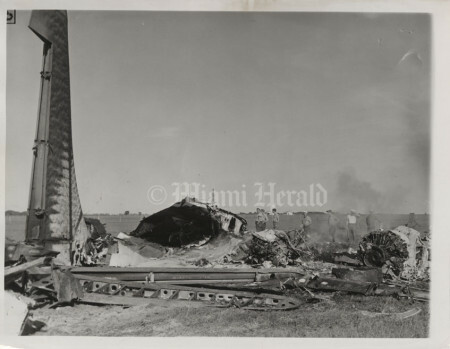 A total of three wooden hangars burned during a hurricane September 15, 1945. 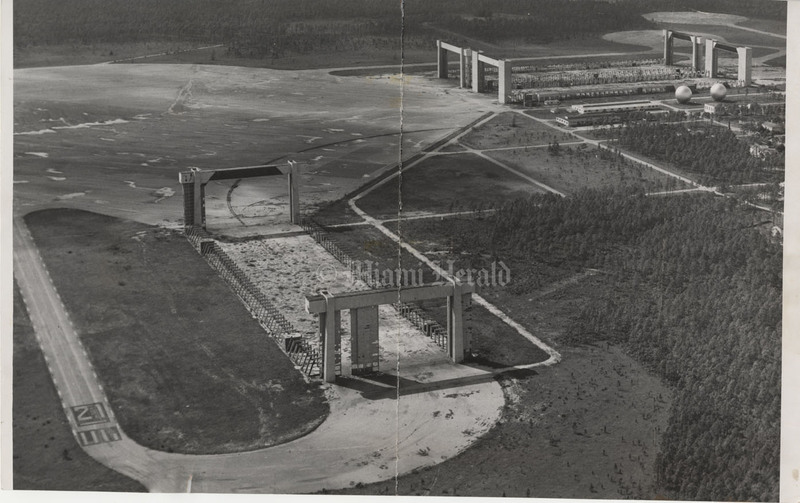 11/13/1954, Bill Sanders/Miami Herald Staff-- Aerial view of Naval Air Station Richmond, with concrete skeletons of three immense blimp hangars. 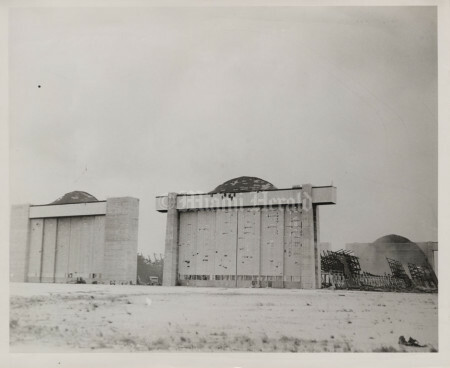 The hangars were destroyed by fire during the hurricane of September 15, 1945, along with 25 blimps and more than 360 aircraft that had been flown to the base to shelter inside them. 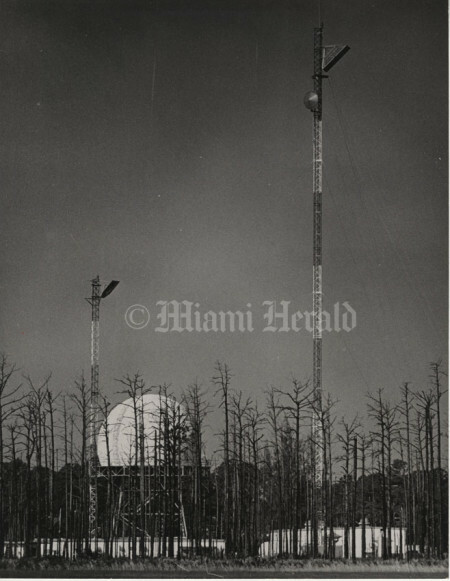 8/13/1952, Stan Wayman/Miami Herald Staff-- Published 8/14/1952 with the caption: "Base Back In Limited Service at Richmond is inspected by Capt. A. E. Buckly (note, back of picture spells it Buckley), commanding officer at the Naval Air Station, Key West; Rear Adm. Irving Duke (note, back of photo spells it Irvin T.), commanding officer of the Key West base, and Lt. T.J. Mullin, public works officer at the naval air station. The Richmond base, from which scores of Navy blimps flew on sub-hunting patrols during World War II, has been equipped with a portable mooring mast and will be used as an auxiliary landing field for the Key West air station. 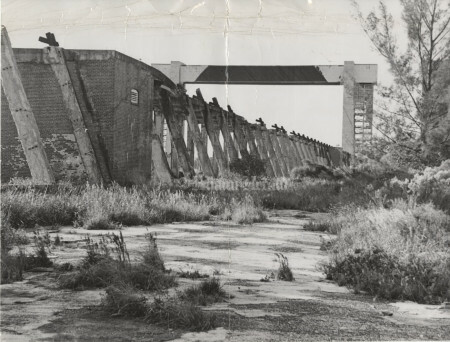 At left can be seen the gaunt concrete door of one of the field's three huge wooden blimp hangars which were destroyed by a hurricane-whipped fire several years ago. 9/12/1945, Bill Kuenzel/Miami Herald Staff-- One of a series of three photographs filed in The Miami Herald archives under Richmond Blimp Base that appear to show the crash of a four-engine Navy airplane. 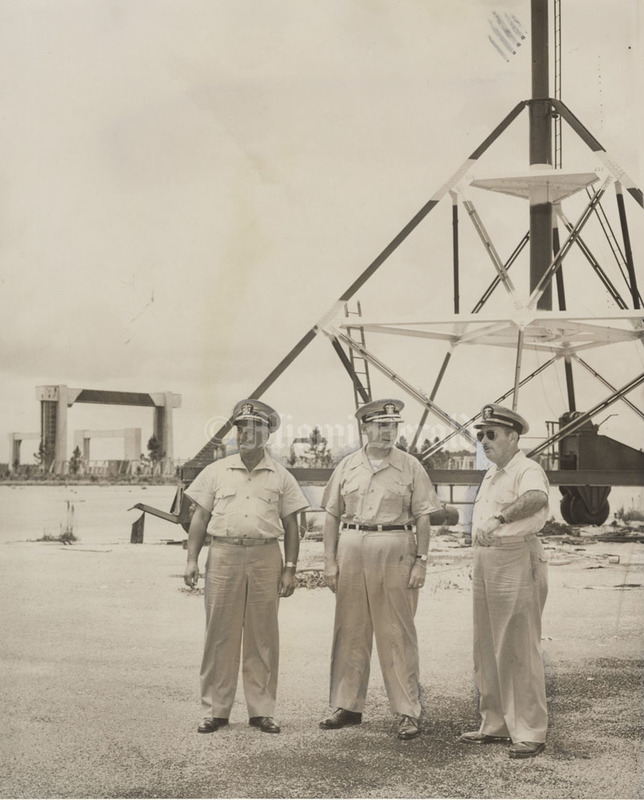 The tall rudder is marked "Navy 59618" in one of the pictures. A Jeep with fire-fighting equipment is in two of the pictures and men in sailor caps are in two of the pictures. 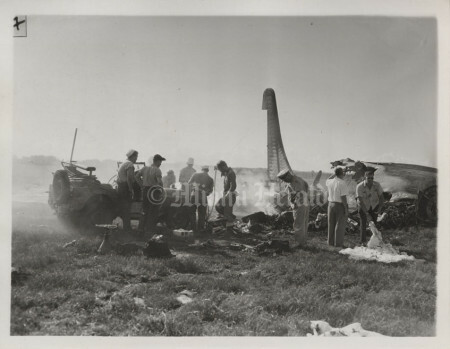 Other sources indicate that Navy 59618 was a PB4Y-2 Privateer that caught fire and crashed on take off from the Navy's Master Field (Opa-Locka Airport). 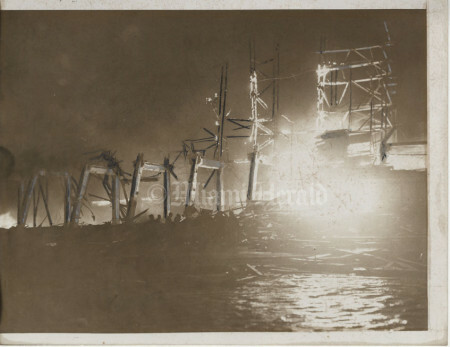 One crew member bailed out and survived but 14 aboard died. Undated photograph labelled "Miami Herald Staff Photo" on the back appears to show the fire at the Naval Air Station Richmond that destroyed the three giant wooden blimp hangars. 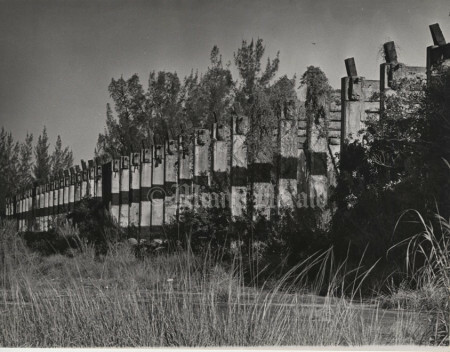 The hangars burned during the hurricane that struck the area on September 15, 1945. 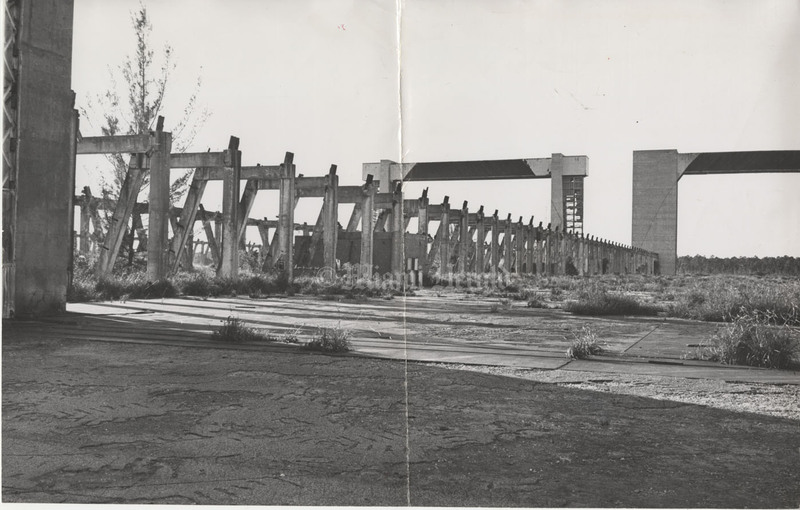 The ruined interiors of the hangars appear to still be smoking in this photograph. Undated photograph labelled "Herald Photo" and "Hangar No. 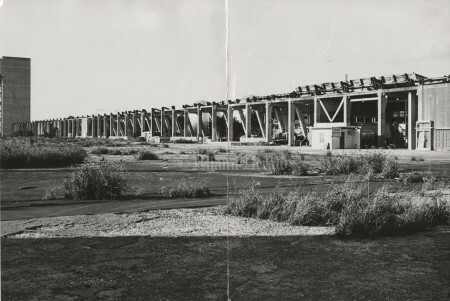 2" on the back appears to show a fire at the Naval Air Station Richmond with the concrete framework of the blimip hangar visible as parts of the wooden structure continue to burn. 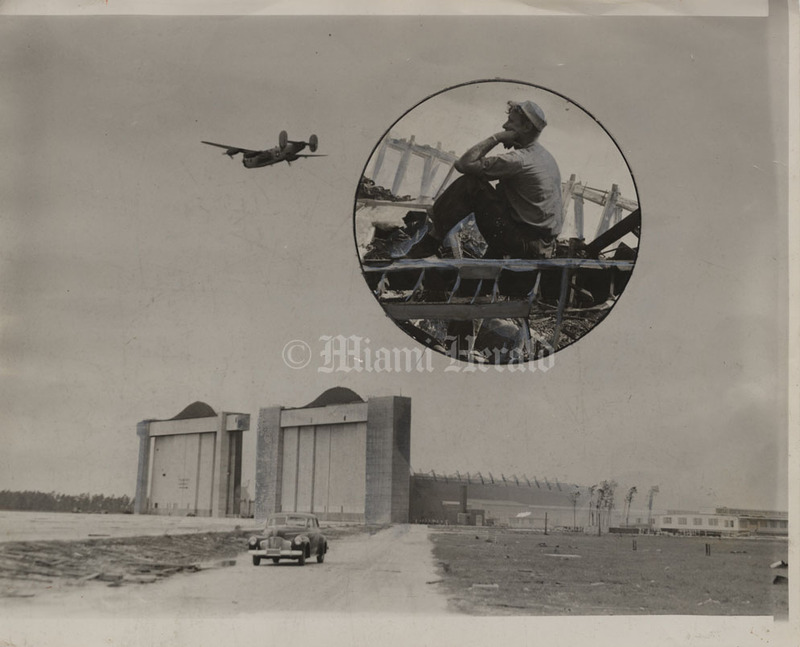 The three giant hangars at Richmond were destroyed by fire during a hurricane September 15, 1945. This photograph was heavily retouched for publication. 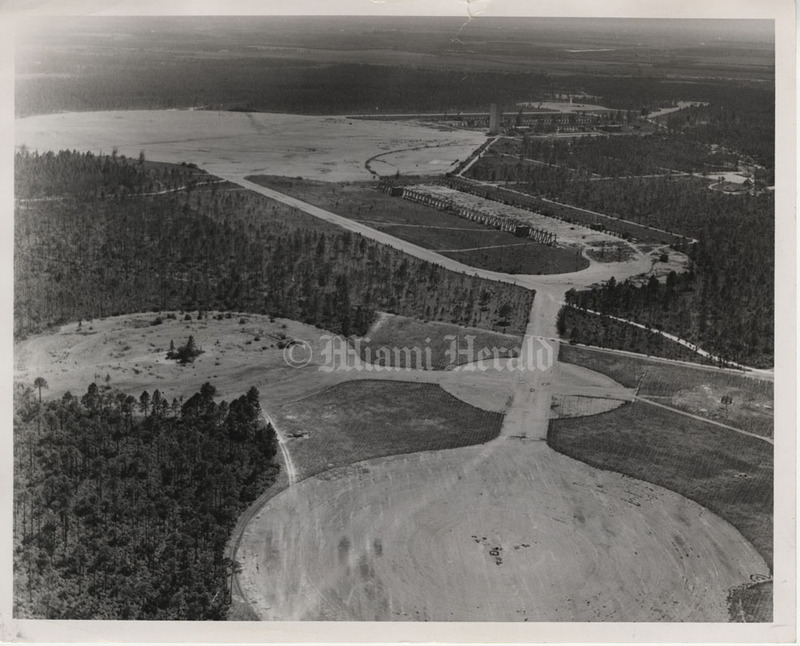 1/1/1978, Joe Rimkus Jr./Miami Herald Staff-- It's a land for all reasons: The 1,800 acres in the Coral Reef area of South Dade has been many things: Crop land for early settlers, a blimp base in wartime, a CIA training camp.